After playing A-J passively, @JonathanLittle decides whether to bluff catch on river with ace-high. Time to bluff catch? 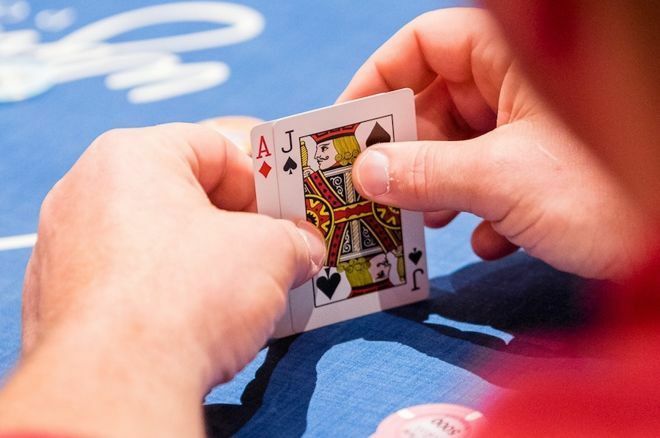 Consider whether you'd call or fold to this river bet when holding ace-high. This week's hand comes from early in a tournament when the stacks were deep and the blinds 50/100. Dealt in the hijack seat I raised to 300 and got one caller in the big blind. The flop came , and my opponent checked. As I discuss in the video below, when deciding whether or not to continuation bet in this sort of spot (a very common one), you want to think about how often your opponent will fold as well as whether or not you are extracting much value by betting. Here it's probably not likely my opponent is going to fold to a c-bet, and for a couple of reasons I'm not getting a lot of value by betting, either. I also wouldn't want to get check-raised here and have to fold, so taking all of that together I decided to check behind. The turn brought the and my opponent bet 400 into the pot of 650. In this case I think ace-jack is actually a little too good to fold and so I called. The river then brought the , and with 1,450 in the middle, my opponent bet 900. As the headline suggests, I had a decision here whether or not to try to bluff catch with my ace-high and call. Is my opponent bluffing here? With what hands would he bet this river? There were so many bluffing candidates out there, calling seemed the right choice and in this case it turned out to be correct. Would you have called this river? Bluffing With Nothing: Barrel Again or Give Up?